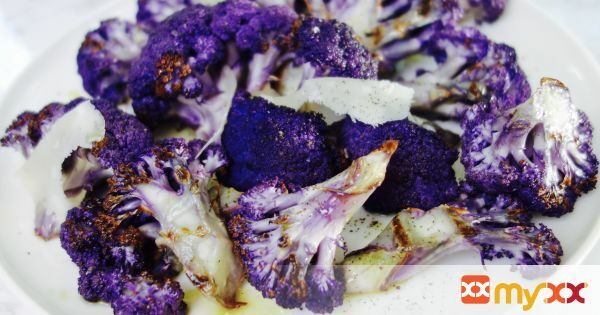 Every time I see purple cauliflower at the store, I make sure to grab it because the color is so beautifully vibrant and might even get picky eaters to try it. 2. Cut each cauliflower into thick “steaks” about 3/4" thick. 3. Brush cauliflower all over with oil and season liberally with salt and pepper. 4. Place cauliflower on grill, cover, and cook until tender throughout, 10-15 minutes, turning once. 5. Transfer to a plate, top with freshly grated parmesan cheese, and olive. Serve.